Report by TCFPA President Todd "PinTed" Andersen . 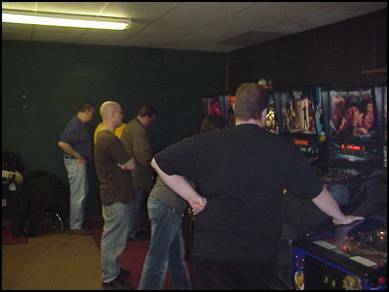 The final Last Man Standing pinball event was aptly the 2006 Year-End Single Elimination Pinball Tournament. The tournament was held on Saturday, December 2nd. 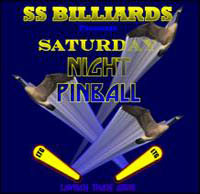 And, it was held at a location Pinball News has recently updated its report on, SS Billiards in Hopkins, MN, USA . This was the first and only year for LMS. The finality was due to lack of attendance. We just couldn't keep up these monthly events for the same two or four people. 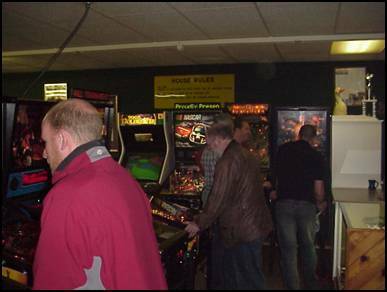 Regarding attendance for the tournament, though flyers were place at local coffee and sandwich shops, and at local recreation centers, and at the arcade, and an announcement was made and updated and a reminder sent out on RGP,and a site was made for the tournament, only nine people showed up for the event. And, of the nine people, one decided NOT to try a second chance at qualifying once his score was bested. This left an embarrassing seven (almost half) machines with no registration even attempted on them. Let us start with heartfelt thanks to everyone who has helped the LMS. For, this last event simply couldn't have happened without our members and sponsors. 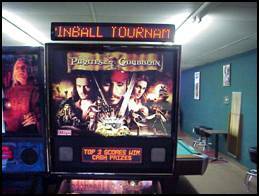 First off, thank you LTG of SS Billiards for providing a great place to play well maintained pinball machines. 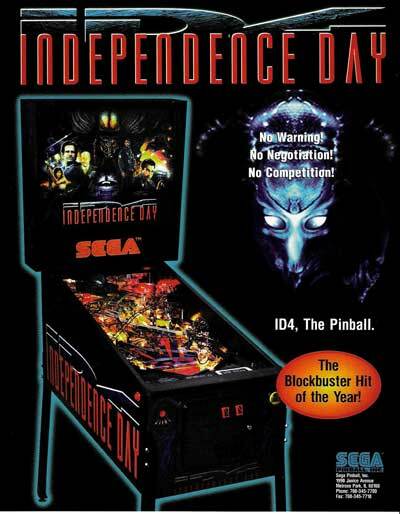 And, thank you for hosting weekly Saturday Night Pinball. 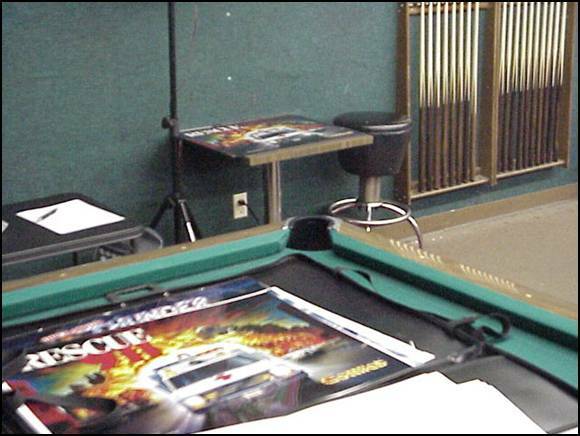 Our thanks to Mike Pacak of Pinball Expo and the Ohio Pinball Festival, for generously providing pinball: translites, flyers, and promotional pinball plastics. 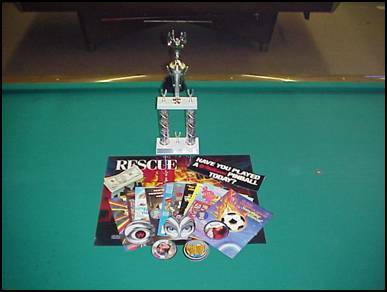 Thank you Pinball Renaissance for providing the trophy and some of the give-away plastics. Thank you PBN for publishing this tournament write up. We would especially like to thank the handful of members who showed up more Saturdays than not. It was for them the LMS was created. Open practice was from 12:00pm until 3:00pm. All of Lloyd's games were priced at their normal setting of $0.50 for 1 play or $2.00 for 5 plays. No one showed up to practice. Lloyd's normal monthly ToPS tournament was in effect for those who wished to try their hand. Lloyd has three ToPS games. Thanks to Mike Pacak, of Pinball Expo and the Ohio Pinball Festival, everyone who qualified for the single elimination tournament was awarded a translite. Several of the eight translites were left unattended. Everyone who registered for the single elimination tournament received a flyer. Everyone who registered got one of these flyers. Tournament registration was to be from 3:00 to 5:00 pm. But, at twenty minutes to 5:00pm, only one person had qualified for the tournament. And, at 5:00 only two people were registered to compete. So registration was extended through the intended break from 5:00 to 6:00 pm. 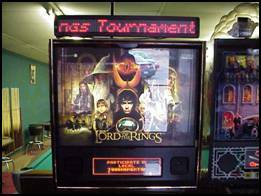 Whomever earned highest score on any of Lloyd's non-ToPS games, was qualified to compete in the single elimination tournament. Due to the low turn out of competitors, the single elimination tournament didn't start until about 6:10pm and was over by about 8:00pm. Everyone who qualified turned in a card with the highest score for his chosen game recorded on it. All of the high score cards were collected and shuffled. Players were matched on the single elimination bracket, from top to bottom, by random order of shuffled cards. To also help keep things fair, the event director flipped a coin to determine game and player order. The person whose name was on top in the bracket “called the coin” while it was in the air. The person who won the coin toss had choice of either determining game or player order. The other person determined what the coin toss winner had not chosen. Competitors played best two-of-three using the games they had qualified on for two of the rounds. Only one competition round went to the third game. 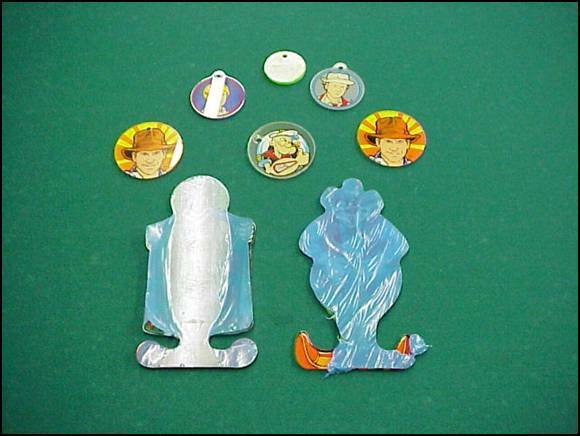 For this single instance, the third game was chosen by the tournament director. Again thanks to Mike, everyone who qualified for the single elimination tournament and registered to compete received one of several promotional plastics. Just a few of the promotional plastics for the random give away and qualifiers. Several of the pin-promos were given out during the event. Two out of all eight qualifiers' cards were randomly drawn for each of the three rounds of the tournament. 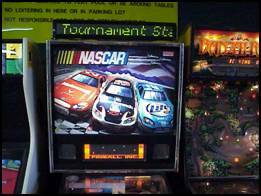 The qualifiers who had their cards drawn were awarded OEM NOS promotional pinball plastics. For the final results, look at the double elimination bracket (75KB Word document) or just read ahead. The final winner, Nick Foss. 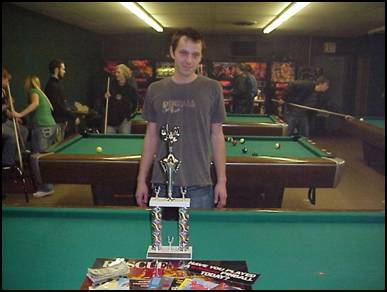 Nick Foss was the winner of the 2006 year end last man standing single elimination pinball tournament. For his efforts, Nick was awarded the following prize package. Lloyd will be open every day and he still plans to have weekly pinball events on Saturday nights. Please see Lloyd's website for details. Thanks again to everyone who participated in LMS. "All we had was one good ball." All pictures courtesy and property of Lloyd / SS Billiards but used with permission.